PIPER O'NEILL Her first giant inflatable sculpture, The Lone Stranger (Inflated), is based on the nostalgic carnival prizes from the 1930s and '40s. "There's not a lot of women working at a really big scale, and that kind of pisses me off," she said. Why shouldn't Seattle's largest, leafiest, loveliest college campus host free public outdoor art exhibitions? What's surprising it that it hasn't been happening all along. But it's here now: Thirteen artists—more than half of them alums, as is Allison Milliman, head of the sponsoring organization, MadArt—created 12 installations across campus. The exhibition, Mad Campus, opened this past weekend and will be up through October 25. It's more evidence of the new era at the School of Art, Art History, and Design, an era incoming chair Jamie Walker hopes will be open, connected, with just more happening than the cloistered recent years. Right out along 15th Avenue Northeast are two large, splashy pieces: Piper O'Neill's huge inflatable dimestore cowboy The Lone Stranger (Inflated) and Kevin McCarthy's shiny robot dog made of iridescent, metallicized vinyl, Sentinel. O'Neill's work rises out of the past, inspired by vintage carnival prizes from a time that looms large in American cultural memory—the 1930s and 1940s—if the antiquing habits of entire generations are to be believed. The Lone Stranger (Inflated) has this sad, blank look in his giant eyes; he's satirizing hero worship (he's (Inflated), after all) while also being lovable. O'Neill's earlier incarnations of these carnival figures, seen at Winston Wächter Gallery, were small and cast in bronze, made precious and commoditized. This one, endearingly, could come crashing down with the pop of a needle. 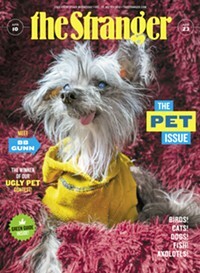 Sentinel, McCarthy's abstracted robot dog, is said to be best seen at night. During the day he might blind passersby and should probably be powering the surrounding buildings. His seams also look a little clumsier than you'd like from up close. At just the right distance, Sentinel maintains the appearance of hovering temporarily like a dream, a futuristic, crystallized companion for the Terminator. 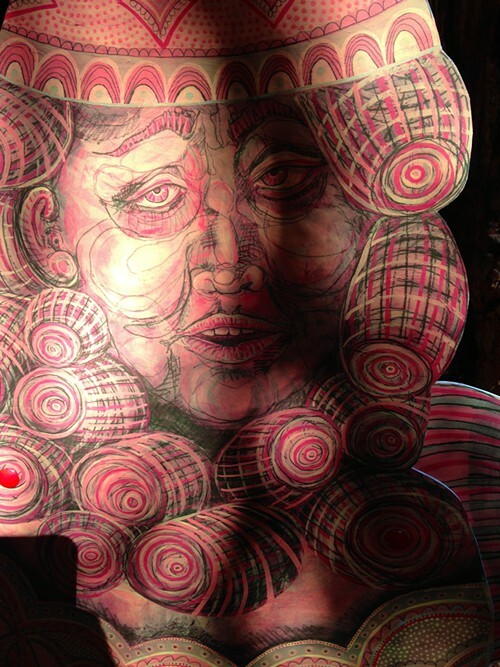 Look for the panel of lenticular photographs standing in for a face. KEVIN MCCARTHY Sentinel, on 15th Avenue Northeast, north of Piper O'Neill's The Lone Stranger. MadArt exhibitions tend to be heavy on construction—artists sometimes performing elaborate physical feats to create their works—while light in tone and scattered in style. A little of a something-for-everyone experience. For Mad Campus, artists were invited to make three proposals each. They were given 17 possible locations approved by UW, ranging from prominent to tucked away. Exploring the locations is what's most appealing about Mad Campus. MAKI TAMURA AND SAYA MORIYASU The installation Hortus Curiosus includes two handpainted banners with slogans from early in the days of UW, when it was relocated from downtown to its current location so students would not be distracted by "the excitement and temptations of city life." For instance, take the installation of an outdoor "room" of concrete mushroom furniture and handpainted banners by Saya Moriyasu and Maki Tamura, in a clearing in UW's Medicinal Herb Garden on the south side of campus. The furniture provides a playful place to rest while you consider where you are. It turns out, as suggested by the banners with their outdated slogans (taken from early UW history) and orientalist fantasia creatures, that this garden was designed to emulate the world's first botanical garden in Padua, Italy. The garden was created in 1911, not long after UW relocated in 1895 from downtown, away from the "excitement and temptations" of city life to its current, bucolic location, reflecting a philosophy about the "right" environment for the development of refined citizens, including the cultivation of nature. Screaming monkeys were part of this vision, evidently. At last week's press preview, we were all standing around in the lovely, quiet garden, where a man unrelated to our tour was sitting on a bench reading, when the artists, Moriyasu and Tamura, introduced their work and mentioned, in passing, "the monkey gates." They kept talking, but I had to ask, "Wait, monkey gates?" I was directed to look behind me, toward the entrance to the garden, where two tall wood poles rose in the trees—mostly obscured—each topped by a screaming monkey figure. According to UW history online, these monkeys have had a rough time of it with vandals since they were erected in 1930. They were also copied from Padua, where carved monkey sculptures, according to this account, referenced Hindu tradition. Moriyasu and Tamura each create work in which cultures cross and collide in both beautiful and jarring ways; their joint installation here is another example, unlocking a strange bit of living history onto a different world. The garden comes to life. Less successful in another area of the large botanical garden is Tory Franklin's Six Swans, a series of cutout and painted plywood figures arranged at the base and in the branches of an old-growth redwood. It's just too awkward to install something here; the ropes and strings get in the way of the scene coming together. Franklin's elaborately patterned figures are as alluring as ever, especially the tortured woman at the center. What a powerful surprise it would have been to run across just her, alone, strapped to this redwood, suffering, without all the stagecraft flying around her. TORY FRANKLIN'S SIX SWANS This is the face of the tortured woman at the heart of the Grimm's fairytale, seen strapped to a redwood tree on the south side of the UW campus. Paul Komada made full use of the awkwardness of installing art in a tree. He was given for a location what's probably the largest tree on campus, the mother of all campus trees, an unmissable red oak in the middle of a lawn near the middle of campus. 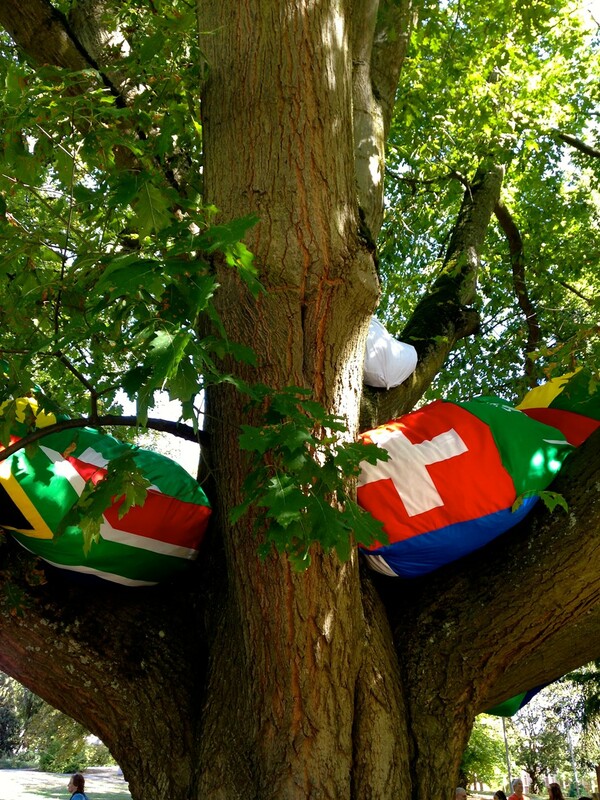 Komada's great lumpen bean bags made of national flags are sagging in the huge crotches of the tree, weighing it down. They look a little like crashed hot-air balloon missions, fun parties ruined. The nations represented are those who contribute the most to global warming, Komada said, and the title of the piece is Global Bloblem. One of the more transporting works is Alyson Piskorowski's suspended mobile made of Mylar strips, hung under the joint canopy created by a group of trees on the Quad. As the strips shimmer in the wind, they grab the trees' reflections and make them flutter and glint in a constantly changing optical illusion. The strips are like blinds, flaying the view, and the effect reminds me of those swooping, heavily engineered modernist webs by Naum Gabo (d. 1977). The piece really has to be seen in motion rather than in a still image, but please forgive the poor quality of this video. If you're walking near the Burke and you come across Evan Blackwell's plein-air cabinet of curiosities on a table under some trees, you get the impression that part of the Burke's collection of oddities has been moved outdoors. 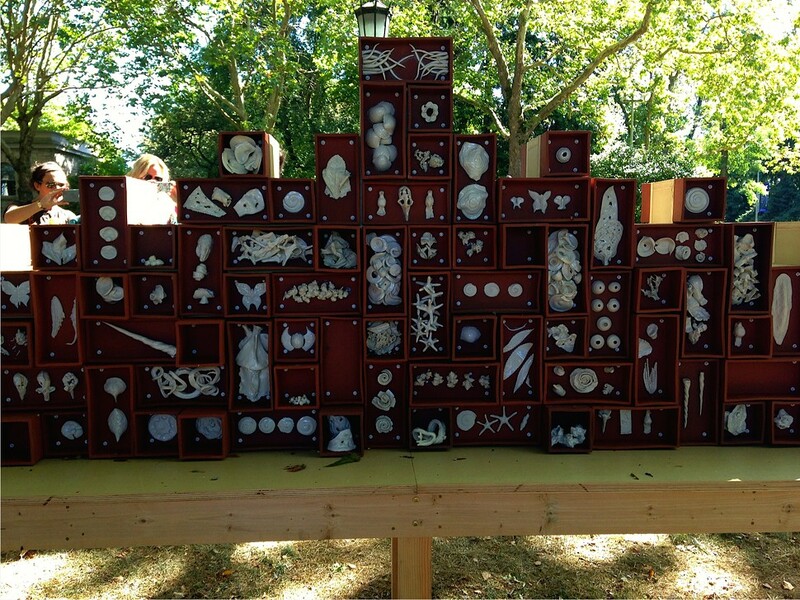 The artist did take his inspiration from the specimens that are in those hidden drawers in the back rooms of the Burke—shells, bones, tiny dead birds still wearing their feathers, fossils, snakeskins, dragonflies—and he re-created their forms in his studio, while also adding his own (the horn of a unicorn, for instance). Everything is in porcelain and earthenware: everything is delicate and trusting. Even the boxes of the shelves are ceramic. The white pieces inside the brown boxes range from rough to fine, some glazed, some not. It's an adventurous piece to put out in public. With all its little parts, it's like the bones of a large animal have been spread out on the ground by someone who believes they will be admired rather than smashed. EVAN BLACKWELL Relics of Experience, near the Burke. 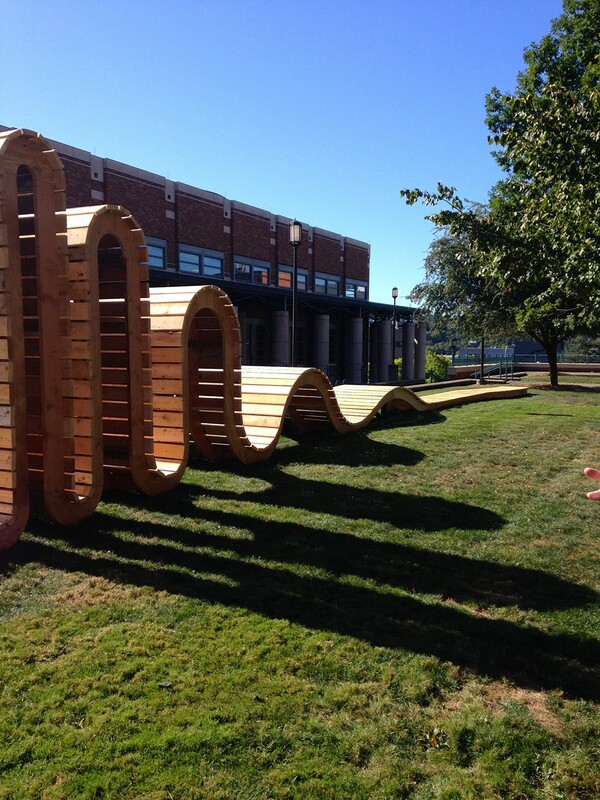 Wave Sine by W. Scott Trimble is its own mini-playground, and you're welcome to climb on it, sit inside it, or just watch its shadows move. 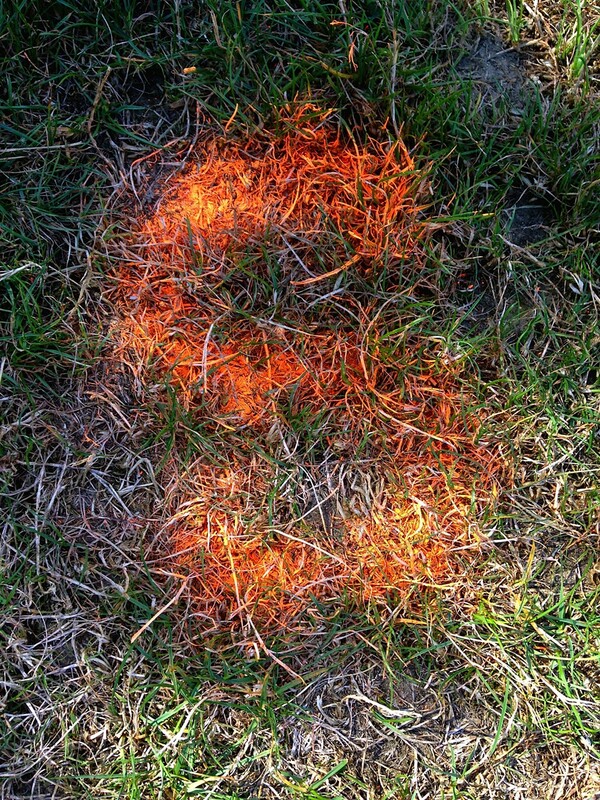 It is, as you may have guessed, a sine wave, set on a lawn outside the astrophysics building. It's strongly constructed—a wave as strong as house. "Elephants could climb on this thing," MadArt director Tim Detweiler promised. W. SCOTT TRIMBLE Wave Sine was inspired by a geeking-out with some astrophysicists involving wormholes. Bikers and walkers pass through the middle of Perri Lynch's installation By Degrees in the Quad. The piece is made of flags encircling one of the Quad's arterial pathways. In orange spraypaint down on the grass, Lynch marked the actual directions of the map, but they're hard to believe. True north, south, east, and west seem out of sync with their immediate environment because of the aggressive system of pathways and plantings that forms the landscape architecture design of the Quad. That design is a map of its own with no relationship to global directionality. It redirects your perspective, and Lynch's art reorients you. It feels so familiar to think that you're pointing in exactly the right direction when you are absolutely not. SOUTH IS WHICH WAY AGAIN? Perri Lynch's compass rose of flags in the Quad reveals how landscape architecture can make the world seem like it's oriented differently. At UW, I'm not sure Friedman got exactly right the number and placement of pieces in order to create a coherent whole in the overpowering environment of the Square, but the sense of what he's doing is clear: he's writing with a secret language that even he doesn't fully know. Its meanings are in the curves of the marble and the interactions between the wood and the stone. 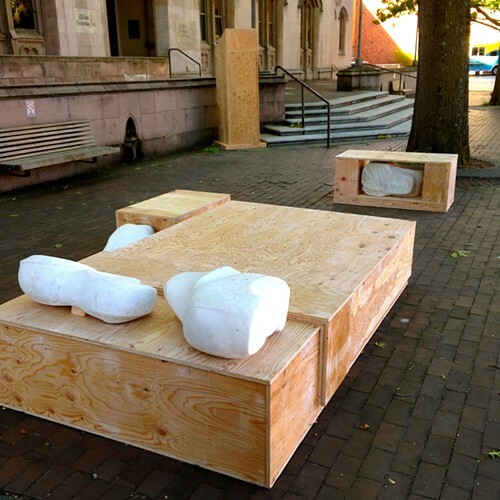 My favorite moment is a plywood platform with two white marbles at its head that brings to mind a bed waiting for its people. The installation is called The Legend of Jerry Roundtree. Detweiler explained it's Friedman's "ode to a drywaller." Is this the world's first ode to a drywaller? What makes Jerry Roundtree's walls worthy of posterity? How does anyone performing a rote task elevate his work to an art? To try to find out more, I looked up Roundtree on Google. I found nothing except a Bothell company with "1 employees": Jerry Roundtree. He's a working-class hero in Red Square. SETH FRIEDMAN Part of the assorted sculptures that form The Legend of Jerry Roundtree in Red Square. There were two works we didn't get to see on the preview: Lux Sit by Julia Chamberlain and Burnt into Time by Brian Widmaier. Chamberlain explained that her work, a series of neon tubes in a dark grove next to the women's building, is meant only to illuminate what is already there, rather than to add materials. She said she wants to provide "a mysterious invitation to something that already existed"—Mad Campus in a nutshell.